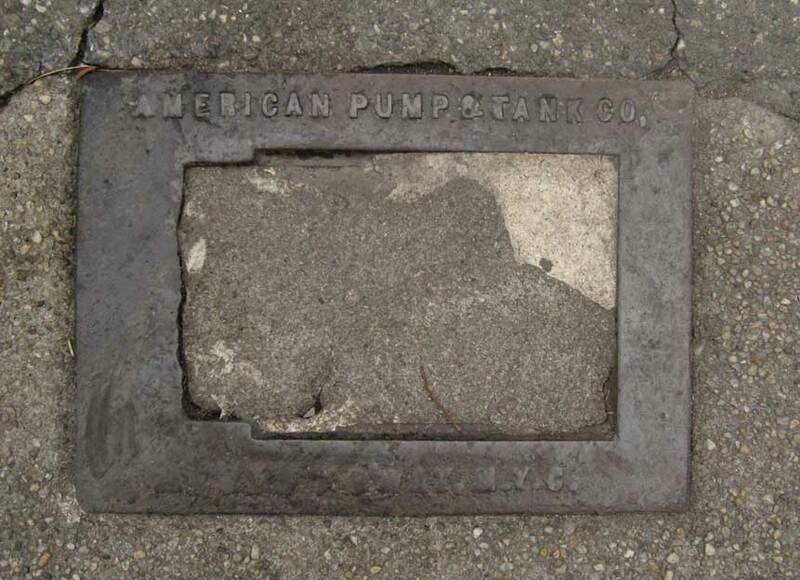 American Pump & Tank Co. The American Pump & Tank Co. were manufacturers of gasoline pumps and tanks and other automotive accessories. So what is this obscure fragment of iron with their name on it doing in the middle of the sidewalk on a quiet residential street like Horatio St. in Greenwich Village? Was there a garage or service station pumping gasoline here at one time? Could this be a leftover part of an opening to gasoline tanks located beneath the sidewalk? I am afraid I don't have the answer to this question, but certain things are known about American Pump & Tank Co. The bottom half of this iron rim probably had the address 1777 Broadway, since this was the address of the company's offices in New York from approximately 1912 to 1920. Their presence in New York extended from 1912 to 1927. From 1921 to 1927 their offices were located at 302-308 W. 58th St. Both addresses are in the center of what at one time was a popular area for auto dealerships, New York's Automobile Row. Company officers at American Pump & Tank Co. in New York were a physician(! ), Elbert Wellington Blakeslee (1871-1932), and James Kemper Ellyson (1881-1952). Blakeslee was Ellyson's brother-in-law. He married Ellyson's sister, Mary Berkeley Ellyson (1879-1931). The couple probably met in Newport News, Virginia, where they both lived at the time of the 1900 U. S. Census. Blakeslee was born in Pennsylvania and was a graduate of the medical school at the University of Pennsylvania (1897). The Ellysons were Virginia natives. In 1923 Berkeley Ellyson Blakeslee applied for a passport, where she declared that she was born in Richmond, Virginia, 31 Jan. 1884, and that she had married Elbert W. Blakeslee in New York City 6 Sept. 1906. The application said that Elbert Blakeslee was born in Hartford, Pennsylvania. Mrs. Blakeslee asked to have the passport mailed to "E. W. Blakeslee, 302 W. 58th St., New York City c/o American Pump & Tank Co."
But all was not well in the marriage. In Dec. 1930 the New York Times reported, "Bridgeport, Conn., Dec. 16 (AP), - Mrs. Mary Berkeley Ellison Blakeslee of Westport today obtained a decree of divorce and $5,000 alimony from Dr. Elbert W. Blakeslee, former New York physician, also of Westport..." Then less than a year later, "Westport, Conn., Nov. 11 (AP), - Mrs. Elbert W. Blakeslee, 50, divorced wife of Dr. Elbert W. Blakeslee, formerly a prominent physician of New York, and a sister-in-law of Robert A. Stranahan, president of the Champion Spark Plug Company, died suddenly today at her home. Her body was found by her brother, J. Kemper Ellyson, who said she had not been ill. ... Mrs. Blakeslee was divorced in December, 1930 ..."
Next it was Blakeslee's turn. He died 15 July 1932 while serving as ship's surgeon aboard the SS American Merchant. A report filed by the American Consular Service in London, England, said that his death occurred "at sea approximately 500 miles west of the Bishops" and was caused by "pulmonary hemorrhage from pulmonary tuberculosis." Relatives (so far as known) were the deceased's son, "Albert Blakeslee, III, c/o Champion Spark Plug Co., Toledo, Ohio." A death notice in the New York Times, 30 Dec. 1952, reported J. Kemper Ellyson's death, "Ellyson - J. Kemper of Imperial Road, Westport, Conn., at Sarasota, Fla., on Dec. 27, 1952, husband of Daisy R. Ellyson. … Interment in Willowbrook Cemetery. Several internet auction sites offered American Pump & Tank Co. gasoline pumps for sale in July 2012. One had been sold for $700.